In Every Day I Wake Up Hopeful, director Rhiann Jeffrey allows Malachy’s chirpy sense of humour to get the audience tittering from the second line of the play. Actor Simon O’Gorman, robed in his dressing down, begins to speak from a reposed position on a chunky sofa that seems more sturdy than his frame of mind. His very male and middle-aged views on exercise, gravity and animals generate varying degrees of laughter, though the most fulsome shrieks of mirth from women – young and old – in the audience last night were saved for his treatise on vaginas. In a year since its last outing at The MAC, so much is improved in this restaging of John Patrick Higgins’ play. 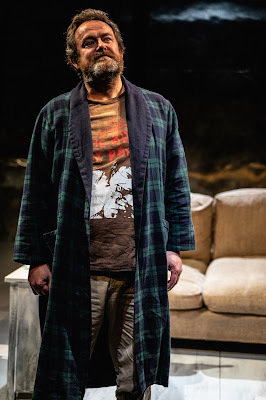 The pretentious watery set and background music has been banished, allowing the playwright’s voice to break through, and giving the audience the freedom to more fully engage with the wit and pathos on display. The Chuckle Brothers scene has us howling at Malachy’s humiliation. Anyone who has read Higgins’ reviews and rants will know that he has an exquisite way with words. It’s not a ‘nugget’; instead it’s the more supremely glorious “chicken in its little breadcrumb suit”. We enjoy Malachy recounting the ups and downs of relationships, until the atmosphere changes in an instant when he explains about the tragedy that has shaped every subsequent day of his life. O’Gorman’s timing is perfect, as he quickly tacks back and forth with the prevailing emotional wind. Amusing melancholy is replaced with deep sadness, then outbursts of anger and frustration, before a dark despair finally settles over the bedsit. What is normally locked up inside is given permission to be expressed and exposed. 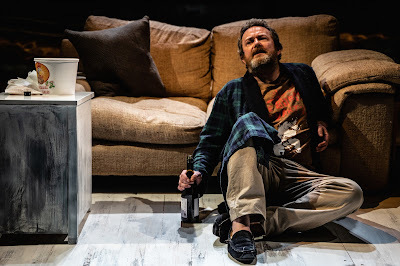 The tilted stage adds to the feeling that the character is being propelled into this descent by some unseen force; the mirrored panels that rise high above the stage remind the audience that we are with Malachy and, often, we are Malachy. May we all remember that hope can be more sustaining than tormenting as we navigate the joys and sorrows of 2019. It’s a simple lesson that needs to be learnt, and one that Higgins’ play and O’Gorman’s performance does its damnedest to share.